Be a part of the 2nd Annual Santa Cruz County Affordable Housing Week! Join the folks with the Monterey Bay Economic Partnership and many guests and community members for a meeting and discussion which will focus on housing education and awareness. Learn about the pros and cons of the Measure M (the city of Santa Cruz Rent Control Initiative), Measure H: Santa Cruz County Affordable Housing Solutions Bond, as well as State Propositions 1, 2, 5, and 10. Attendees will also be able to meet the candidates running for City Council and the County Board of Supervisors, who will be sharing their housing agendas. Appetizers and non-alcoholic beverages will be provided with a no-host bar. Self-parking at the Hotel Paradox is complementary, and valet parking will be available for an extra charge. Additional metered parking is available on the nearby side streets. Tickets are available at no cost, but you must RSVP using this EventBrite link. Please don’t reserve a seat unless you are sure you can attend because space is limited and they need an accurate head count. We have a critical housing shortage in Santa Cruz county – especially affordable housing. Housing affordability is rated at just 12% of households being able to afford to purchase a median priced home, which is the worst in the entire state of California. Attend this event to learn what’s being done, and what more could be done, to address the urgent structural problems with housing in our area. It’s no secret that we have a housing crisis in Aptos and in Santa Cruz. To begin to address the issue, the Santa Cruz Housing Solutions Initiative has been created. The Housing Solutions Initiative aims to provide affordable housing for local workers and vulnerable populations through a bond measure of up to $250 million, proposed for passage by voters in the fall. On Wednesday, April 11th, 2018 at 5:30 PM there will be a community meeting of the Housing Solutions Initiative at Twin Lakes Church. Affordable Rental Housing Development Fund to create and preserve affordable rental housing by funding land acquisition and development costs. Home Ownership Fund to facilitate first-time home ownership and help vulnerable homeowners keep their homes. Homelessness Fund to support permanent supportive housing, transitional housing and emergency services facilities. Innovation & Opportunity Fund to make it possible to respond quickly to opportunities to preserve and expand affordable rental housing and/or prevent tenant displacement. Supervisor Zach Friend and Capitola Mayor Michael Termini will host this community meeting. Learn more about the proposal, and share your thoughts and experiences. Remarks will start at 6 p.m. 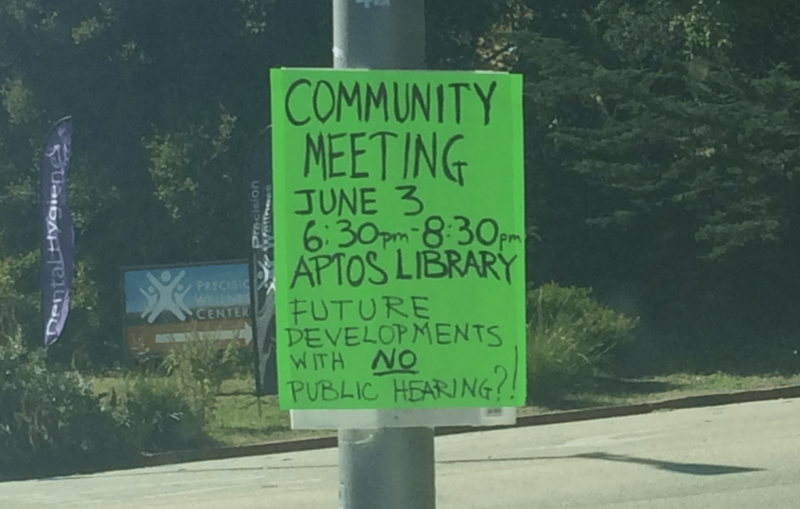 The purpose of this gathering is to update residents about the Aptos Village Subdivision, and the potential future changes to the County Planning Department building permit process that may violate Measure J stipulations regarding public hearings on land use. Planning Director Ms. Previsich presented some of these proposals to the County Board of Supervisors at the May 19 meeting and will continue the presentation at the June 9 meeting. You can view and listen to this presentation via the Board of Supervisor website: www.co.santa-cruz.ca.us/… and click on May 19. A guest speaker for the meeting Gary Patton, former Santa Cruz County Supervisor, land use attorney, and the “author of Measure J.” It should be an interesting evening and worth attending!